We posted previously that we were close to launching our new CrossFit line-up. The cool thing about this product launch is that it was developed over a period of 5 months, with 5 athletes that are extremely competitive and immersed in the sport. This was important to our Team at Infinit, as none of us had any first hand knowledge or had participated in the sport. The end product incorporates each of the athlete's feedback and some of the learning's we have picked up along the way. The blends are not flashy - they contain real fuel that have been proven for years to be the key in full recovery after intense workouts. Our proteins are best in class - you will not find a protein with a higher BCAA content, which drives complete muscle repair and associated growth. 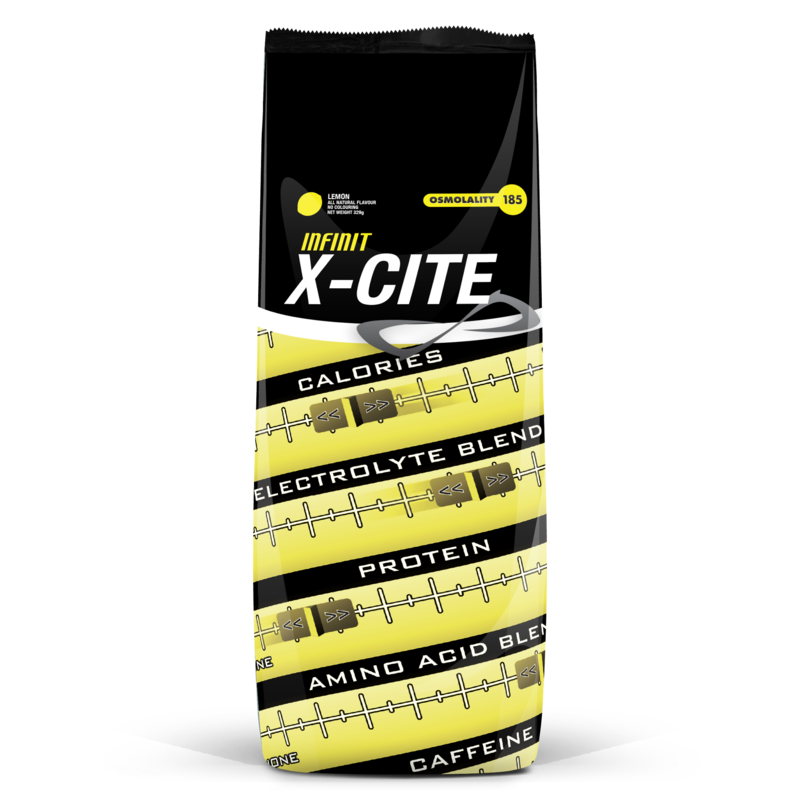 INFINIT XCITE - prehydration / workout blend that primes/fuels you through the toughest of workouts. Starts the recovery process. 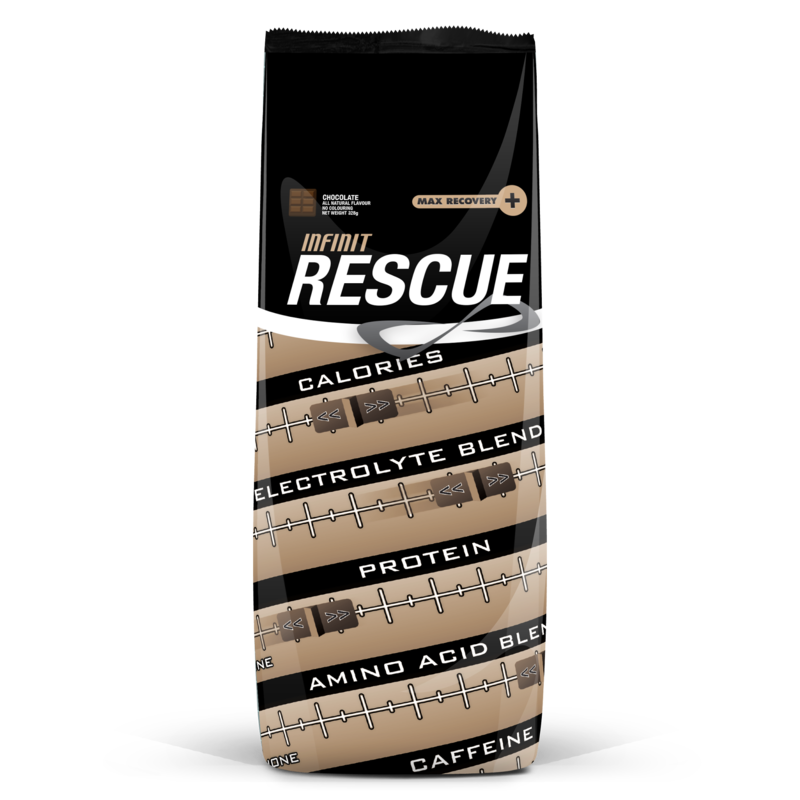 INFINIT RESCUE - recovery blend loaded with Hydrolyzed Protein, Whey Isolate, 3-Carbs, BCCA's and Electrolytes. Will complete the recovery process. INFINIT RAW - 100% Whey Isolate, nothing else. For those who cannot attain all of their protein requirements through real food. Cleanest, best source of protein for athletics period. Thanks to Dan Bosco, Kyle Cant, Jolaine Bloom, and Erica Livett for working with us and providing the candid feedback that lead to these incredible new blends. The new pro shop at the Windsor Aquatic Centre is scheduled to open in April. Jenn and I met with Kristen today and have set up the display stand filled with the ultimate swim fuel. As you can imagine, we are thrilled to be showcased in Windsor's jewel. If you haven't checked out the new aquatic centre - what are you waiting for? First class facility! We first met Melissa in October of 2013, I was a bit embarrassed that we didn't know of Melissa Bishop, a Lancer grad, who was not only Canada's top 800 m runner, she had competed at the 2012 Olympic Games. I still marvel at the talent we have in our community and how little known it is. I hope you find the interview as insightful as we have. Infinit: How did your running career start and who supported you along the way? Melissa: I started out playing soccer. My first coach, Mike O’Grady (now my Optometrist) always said I was going to be a good runner because I could run up and down that soccer field and not get tired. He was probably the one who put the dream in my head to be an Olympian. In school, I remember the first time I ever thought about even attempting to run. I was sitting in my grade 4 classroom, with my teacher, Mr. Brash, and an announcement came on saying “if you want to try out for the cross country team, meet at lunch hour at the recess doors for practice”. So, out I went and I don’t think I’ve ever really looked back. I wasn’t one of the best runners to begin with; I’d say top 7 in every race though. In elementary school I did every single event I could. No throws, but I long jumped, triple jumped, high jumped, 100m, 200m, 400m, and relays. I just couldn’t get enough of it. It wasn’t until I got to grade 7 or 8 that I started to come into my own. At that point I had joined the Ottawa Lions Track and Field Club. My parents/grand parents would drive me the 2 hours one way to Ottawa 3 times a week for practice. Until I was able to drive they were (and still continue to be) a huge part of my development as an athlete. Without them I wouldn’t have been able to gain the access to coaching and competitions in the bigger city. In my grade 9 year I won OFSAA in the 400m, and competed in the 200m; and was 2nd in OFSAA cross-country. I think at that point, I knew the thought had definitely crossed my parent’s minds, and mine as well, that I maybe had the potential to reach the Olympics or the level I’m at now; but it was just a thought. Not until probably a few years leading up to the Olympics did I think it would become a reality. In grade 12 mid-way through the school year I made a big decision of moving to Ottawa to lessen the travel time and gain the recovery time. I left home at the age of 17, moved into a house with a wonderful friend, Anne, who took me under her wing. I moved schools, left all my high-school sports teams, stopped playing hockey & volleyball, made new friends, adapted to city living (I’m from the country, fields full of cows for neighbours, dirt road, you name it), I had to sit out my last year of OFSSA (which is everything in high school)… only to get a few months into my move to find out I had a stress fracture in my toe. I think I cried for a week straight because a) I was homesick and b) my world was ending because I couldn’t’ run. I was immediately put into an air cast. I didn’t compete that summer, and slowly got back into things the following fall. It was around this point in my running career where that small thought of making an Olympic team was crushed. I slowly started to lose focus, running felt like a chore, and I really wasn’t having fun. But I still continued to just go through the motions. That fall I was entering University and decided to stay in Ottawa and train with the coaches I had been for the past 4 years. That winter we were training for the Ontario University Athletics (OUA) Championships and the day before we were to head out, the University pulled the plug on the track team. At that point, the University of Ottawa didn’t have a track and field team officially; we still were training however, because it was in the works. From then on I decided I needed a change. I started looking for transfers to other schools, and the University of Windsor quickly rose to the top of my list. With the history of success and a highly decorated head coach, Dennis Fairall, I decided that I would make the 8hr trip to Windsor and move, yet again, starting fresh. Turns out, my decision to attend the University of Windsor was my best choice. I was able to get the degrees I wanted, I found my love for track and field again, and had lots of success in the CIS. I completely bought into the program with Dennis, and committed to everything he said. With the success in the CIS I have to say that my dreams of making the Olympics came to life again, and I really wanted it. The year after I graduated from Windsor, I made the 2012 Olympic Team. I took the 2012-year to dedicate to training. I didn’t work or go to school, I trained every day, put all my time and energy into it. Currently, my job is athletics/running/track and field/ training for Rio 2016. I still continue to train full time and hoping to be better than the last year or last race. Infinit: Your focus is 800 m, how and why has that become your race? Melissa: When I was in high school is when I made the switch from the 400m to the 800m. I made the World Youth team in the 400m, and had lots of success in it when I was younger, like OFSAA medals, Ontario Championship medals, etc. I became an official 800m runner likely when I started University. I still “dabbled” in the 400 and some off distances, but 800m was my primary event and has been ever since. It’s a real science to figure out an event like the 800m; I still haven’t got it down yet. I’m constantly learning something new about the race. During our outdoor season I don’t do too many off distances, I recently just did my very first 1500m race and it was indoors. I think I will probably try a few of those outdoors this year. Infinit: What was the defining moment and who most influenced your success? Melissa: My breakthrough year was in 2012. Not just because it was an Olympic year and I made the Olympic team; but because I had made some great strides in my training and everything was showing in competition. All the hard work I had been doing for the past 10 years leading up to 2012 was finally coming together for me (and still is). Dennis Fairall is and was my coach during this breakthrough and I give him full credit for all of it. Prior to 2012, Dennis had coached me for 4 years. In 2012, we both committed to training full time and we saw great results. I went from a 2:02 runner to a 1:59 runner in a matter of weeks. Running under 2:00 minutes in the 800m for a female is a huge deal. Only 4 women in Canada have ever done it (I’m number 3). Unfortunatley, while running under 2min is a big deal in Canada, it’s the norm on the world stage. So while I feel very accomplished, I know I still have lots of work to look forward to if I want to see myself on a podium one day. Infinit: As you prepare for Rio in 2016, what are the key milestones along the way? Melissa: Coming up this year are the Commonwealth Games. In 2015 Pan-Am Games, which are being held in Toronto, and World Championships, are all in the same year. Those 3 things are the big benchmarks leading up to Rio. In terms of performance- this year I’d like to consistently run under 2:00minutes; and I’d like to find myself in a final and on a podium in these next few years. Infinit: As a full time athlete, can you share what a typical day would look like? When we are on the track doing intervals, these workouts tend to be more intense than long runs, so usually its just one workout a day. Therapy and weight sessions get moved around all the time and could land on track workout days, which is OK. The day just gets a little tougher. Infinit: Who introduced me to Infinit? Melissa: Kurt Downes approached me about Infinit. He had done a lot of research for his athletes, and thought that maybe this would be something of interest to me. When he first explained Infinit to me I was surprised; I didn’t know we had a supplement company here in Windsor- Essex. You mean I don’t have to order things from the USA? That grabbed my attention right away. Point for Infinit. But then, Kurt went on to tell me that Infinit makes their products specifically for the athlete. There is no pre supplement that works for everyone. Each supplement is different depending on the needs of the athlete. This is what got me hooked. A supplement company that gives me everything I’m looking for and ONLY the things I need for proper recovery & nutrition in my pre and post workout drinks. There are no fillers here, no broad supplement to meet the needs of athletes from cross-fit to football to running. A supplement literally made for me! I was sold immediately. I got in touch with Darcy Haggith, and he talked me through what Infinit is about and their core values, then about their products. I’ve been using Infinit for about 5 months now and I couldn’t be more pleased with how I feel pre and post workout sessions. Infint: How did you fuel prior to Infinit? Melissa: Before I found out about Infinit, I was using a broad supplement for pre/post workout sessions. It was made for any sport, covered all the bases for all athletes regardless of energy needs, protein needs, or workout intensities. The supplement was good; but now that I have Infinit to fuel my body, I couldn’t go back to that old supplement. Often times with the old supplement, my stomach would get upset before workouts. I could never understand why until I tried Infinit and I didn’t have that problem anymore. The old supplement was quite heavy in my stomach and it was a little carbonated. Carbonation and a heavy stomach isn’t ideal prior to racing or working out. I made it work, but I think its because I wasn’t exposed to anything else. I didn’t know there was anything else out there. As an athlete, you get stuck in routine and change sometimes isn’t welcomed; especially when it comes to nutrition and supplements. If you find what works, why change it? My old supplement “worked” but I had issues (like the upset stomach). Which is why I was open to try and eventually change to Infinit. My pre workout drink is as light as water in my stomach, has zero carbonation, and it tastes great. I don’t get “water belly” anymore and no longer have stomach issues; but most of all, I feel good using it. Infinit: What products are you using? Melissa: Currently I’m using my Custom blend (pre and during), REPAIR, and RAW protein. I usually start drinking Melissa Sprint Blend 60min prior to my warm-up and continue to sip on it during the workout. If I’m racing, I try and get most of it into me about 30min prior to start time. Post workout/race I’m using the REPAIR; immediately after my session I start drinking the repair. When I’m heading for a weight session or have a longer workout day ahead of me I’ll throw some raw protein into my oatmeal in the morning, or into a shake in the afternoon to sip on while lifting. The biggest difference with Infinit that I didn’t get in my last supplement was a piece of mind. I know with confidence that this supplement is built around me and only my needs. I don’t need the same amount of protein as a football player, nor do I expend as much energy as a triathlete. What’s in my supplement from Infinit is for me and that’s what I love about it. As you can image we are extremely proud to be partnered with Melissa, best of all we know we are fuelling her to her maximum potential. Melissa has a crazy season ahead - we will be providing updates as the season progresses. I have always been a less is more guy when it comes to training. When I read this from Curtis' Blog - thought many of you would get value from it. Learn how he makes every minute count and gain some valuable insight on the key workouts he uses to walk that line of pushing the limits, while being mindful of physical and mental fatigue. It isn’t always fun, the kind of training I put myself through to get the most out of my hectic schedule, but if it was easy, then everyone would do it right? I like to win races, and I love to race, but the real reason I do it, why I get out of bed at 5 to train before my daughter Ellie wakes up is the personal challenge. I want to see what I can do, what I can endure, how fast I can go. I am not a professional athlete. I have to balance my sport with the real world demands of raising my daughter and working a real job. These demands actually help with my motivation, as frankly, they make competitive cycling even more of a challenge. I’m not playing the game on easy! Most of the guys I’m competing with spend more than 15 hrs a week riding their bikes, and many spend above 20. A typical week for me is 10 hours of riding time. To make up for the high volume training I am missing, I train at high intensity a lot, and aim to make the most of my recovery time so that I can make each workout count towards my goals. A good night’s sleep, timely recovery nutrition (thanks INFINIT Canada) and a smart training plan with adequate recovery between hard workouts is just as important for me as the training itself. I also choose fewer, and more specific goals to target. I’m not trying to be a Jack of all trades, but more of a master of one. Don’t get me wrong, I’m not complaining, I’m trying to relate to my audience so you can understand my story. My life away from sport makes me a better athlete. I’m grounded in reality, and having such a wonderful family to come home to takes the pressure off big races. Winning and losing just isn’t as important when they will they love me anyway. My experience as an athlete also makes me a better person away from sport, it’s a great fit! I really don’t think the fact that all my best results arrived after my inspiration, Ellie, is coincidental. So back to my reason for writing this tonight. I want to tell you how I have made high intensity training work for me. High intensity, or interval training involves training at a set intensity (usually high . . .) for a set time period followed by a set rest period before starting the next interval. A power meter to gauge effort makes this type training easier to execute properly, but without that kind of investment a heart rate monitor will help, and simply riding based on perceived effort can be effective but only if you have enough experience. One of my favourite interval workouts is a great example of this. I often recommend it to the athletes I am coaching. I typically aim for 40-50 min total work, but I will vary that depending on the event I am targeting. My work intervals last between 5-10 minutes, and my recovery for ~20% of that. For example, I might do 6 x 8 minutes on / 90 seconds off when I’m training for a 40km TT. The “on” interval is done at the power I’m hoping to hold at the event, and by the end of the workout I’ll have done approximately the same amount of work as the event will require. The off intervals help to break up the work and keep my training at a manageable level. A full gas 40 km time trial is not something I can repeat on a regular basis in training physically or mentally. I like to save those efforts for race day. The short rest periods in this workout don’t let me fully recover, but they do make this workout more sustainable week to week. My other staple workout that I try to do 3-4 times a month I like to call “castles”. This is a workout I’ve transferred to cycling from my rowing days. Picture the jagged profile of a castle wall. This is what the power profile of a castle workout looks like. Again, the durations of the workout can be changed, but I tend to ride for 2 minutes at 90% of my 40k TT power, followed immediately by 2 minutes at 105%, then repeat until the desired duration is completed. I might do 3 x 12 minutes, or 2 x 20 minutes in one session. By the end of this workout I will have done as much as 20-25 minutes of work above my race pace with a very limited recovery period. This is a great way to increase your sustainable power while training your ability to recover from over-threshold intensity while still working relatively hard. This kind of training is not easy, and it isn’t fun in the traditional sense of the word . . . But with the proper motivation and inspiration combined with a good training plan and a solid recovery strategy it can quickly lift your fitness to the next level. Hope this helps you as you ramp up your bike fitness, heading in to your best season ever. Many great moments today-Skype call with Brooke Brown - TeamInfinit triathlete. Meeting with Nick Dwyer of OrthoCare Cycling - we are supporting the Team, did Nick's formulation today. Getting to see our new website, so pumped, looks awesome! Good connection with new retailers, and a few other nutritional consults. This is where my highlight came, a nutritional consult with a 69 year old BC based triathlete. This triathlete has been at it for a few years, very knowledgable and has worked with many products. After a few minutes it was evident that our custom approach was going to solve the sloshing around she was experiencing on the run. It was clear that the issues before were related to having a combination of products in her stomach that were too concentrated to be emptied and subsequently absorbed. Really excited to watch her progress this year. She has a race schedule that many would be proud of. She was an inspiration. Curtis Dearden - Balance is the Key!!! 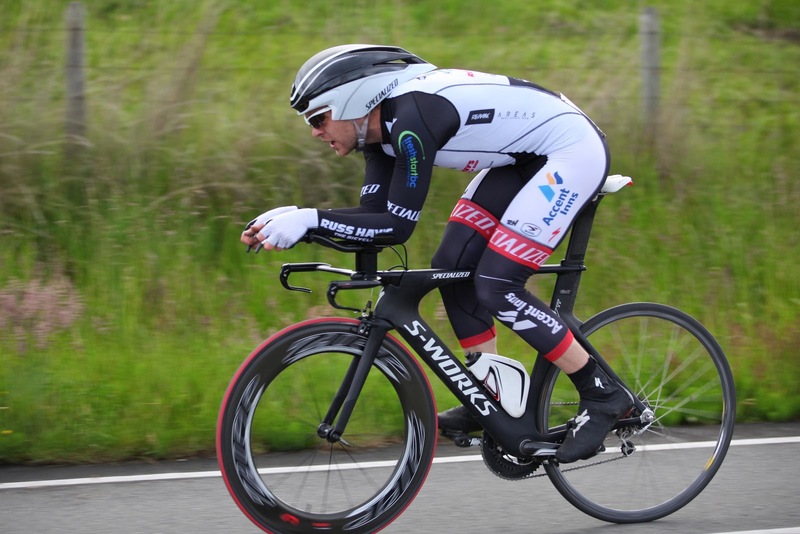 We are in the second year of fuelling Curtis Dearden, the 2013 Canadian Road Time Trial Champion. We are happy to fuel such a balanced and focused athlete, as you will read, athletics are important but not the only love of his life. Curtis who works for Russ Hay's Bicycles in Victoria is married to Amy (Manager of Athletic Services at CSI Pacific) and they have beautiful daughter Ellie. Infinit: Prior to cycling, when you were younger where there other sports that you competed in? Curtis: Starting in grade 8, I was a rower. Through to grade 12 I rowed at Maple Bay, but didn't become really competitive, or any good for that matter until grade eleven. By grade 12, I was winning senior races in the single and double sculls, including at the biggest regatta in Canada, the Royal Canadian Henley. I then rowed for all of my 5 years at UBC, winning 3 National Titles. I even met my wife Amy through rowing! Infinit: How long have you been cycling and has it always been focused on the Time Trial? Curtis: I've always ridden my bike, even while rowing I would use it for cross training. I've been competing in road cycling for 6 years now, and have always been strong in time trials, but only really started focusing on them last year when my daughter Ellie was born. With my growing family I had to pick one target event as my training time became limited. So far that focus is working out great for me! 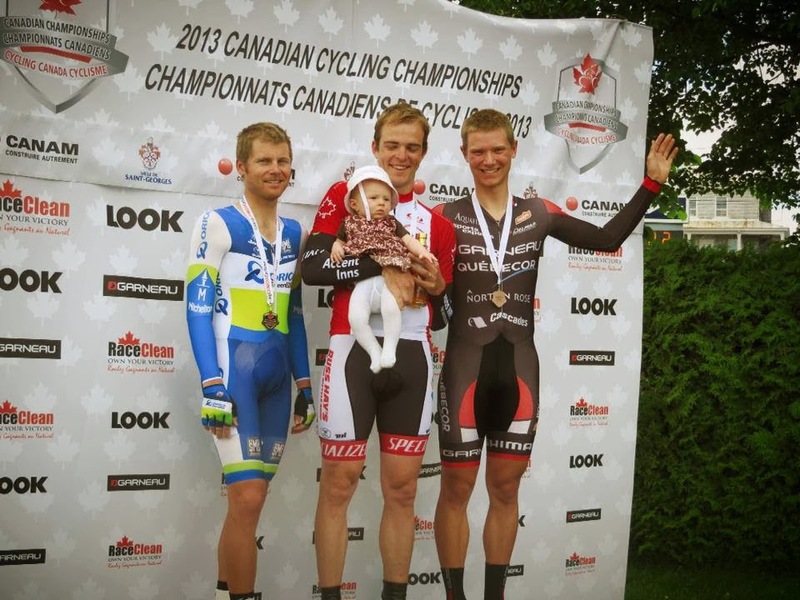 Infinit: 2013 was a break out year for sure, what was the major difference in 2013 that resulted in you being the National Time Trial Champion in Canada? Curtis: The difference for me in 2013 was Ellie, and for a number of reasons. First, as I've already mentioned, she has made me narrow my focus to one event, the one I'm best at. She also takes the pressure off at the big events, there is now something much more important than my last bike race. And I don't have the same amount of training time, which has really helped me to make me train smarter. I have to make sure that every training ride has a purpose and I have to make sure I execute it properly because I need to take care of her. Infinit: What are your goals in 2014? Curtis: My first 2014 goal is to defend my National title. Beyond that I'm hoping to earn selection to the Commonwealth Games in July before transitioning to the velodrome for the rest of the summer to take a run at track nationals in October. Beyond this year I'm looking to continue improving and hopefully the sky is the limit. Infinit: I know that we have formulated a custom bike blend for you and you use Repair for recovery, what do you like most about your fuel? Curtis: The biggest benefits to my bike blend are consistency and convenience. In a matter of minutes I can have bottle ready for my training that will always provide me with the fuel I need to complete my training or racing. I always know what I'm getting, and it is tuned to provide exactly what I need. For my recovery product I am using Repair. Having a recovery meal within 15-20 minutes of finishing a workout is optimal for getting the most out of the training I've just completed and for preparing for my next session. Having the repair blend ready to go for me every time I come home makes this so much easier as again within minutes I can have the nutrition I need. Infinit: Is there anything you would like to share that we haven't covered off? Curtis: I guess I hope that people can read my story and be inspired by it. I work a regular job, and have a young family, just like a lot of other people out there. This summer my wife and I bought a house and we're renovating everything. I'm a busy guy, and I hope I can show that with a smart, efficient, targeted training plan, great nutrition, and the support of those you love you can achieve quite a lot! We wish Curtis all the best in 2014. Check back here to see how his season is progressing. In 2013 we started working with local triathlete Megan Gregoire - we get numerous requests to support athletes, this one was a little different. Megan was only 14 - just about to go into high school, but she had decided that she was going to compete/excel in triathlon and her behaviours well completely in line with her goals. We continue to help Megan with her nutrition, both during and after workouts/competitions, she is an important member of TeamINFINIT. We thought you would like get to know Megan, might inspire another teen athlete. Infinit: What was the first triathlon that you competed in? When did you decide to try it and what compelled you to sign up? Meg: My first race was the Leamington Kids of Steel race in 2010. My dad was training for his first ½ Ironman race in Muskoka and I decided to try it out. It seemed like a sport that I could really get into. Infinit: What was the experience like? What did you love about it and what did you learn from it? Meg: I liked the idea of being able to do three things in one race. I thought the race was just something fun that I could do. Little did I know how it would become a big part of my life. I did learn that is takes a lot of work for one race! Infinit: Prior to triathlon, what sports did you compete in and when did you start those? Meg: Before triathlons, I literally started swimming when I was 6 weeks old. I’ve always been in the water, although I didn’t join a swim club until this year when I joined WEST. It was always swimming lessons through Red Cross. I’ve already got my Bronze Cross certification and I am on my way to become a lifeguard. Besides swimming, I think I’ve tried almost everything – ballet, Irish dancing, soccer, gymnastics, and all of the local running and cross-country races. I did most of those when I was really small, and I started running when I was around 9. Infinit: What are your goals for 2014? What would make you happy to say that you accomplished at the end of the year? Meg: Ideally, my goals this year are to qualify for the 2015 Duathlon World Championships, finish in the top 10 at the Ontario Summer Games and place in the top 3 in Triathlon Ontario’s Junior Development Series. Beyond that, I am really focused on 2020 and 2024 as Olympic years. Becoming an elite triathlete is a long process and I’ve just started to get serious about training. As long as I am getting faster and stronger every day, then I am happy with my efforts. Infinit: When did you first hear about Infinit and what was it about Infinit that made you want to learn more. Meg: I heard about Infinit through the local triathlon community. Their responses about the brand were really positive. I thought that having a product that worked well and was good for you would help me too. Infinit: Tell us about your custom blend and how it is tuned to your body? Meg: My custom blend has extra protein to make sure that as a vegetarian, I am getting the right amount. Also, I am relatively small and in racing an endurance sport, Infinit made sure that we considered my size, the length of the race and my workouts, as well as how much I sweat to get the formula just right for triathlon and for me. I also got the opportunity to blend my recovery formula, which has been a tremendous help in my training. Infinit: What Infinit products do you use and when do you use them? Meg: I use both a performance blend for my workouts and races and my recovery blend for right after a hard day’s training. Infinit: How do you think Infinit has helped you in triathlon? Meg: Using Infinit during long practices and races helps me maintain constant energy and allows me to give a consistently strong effort. It’s important to be able to have quality workouts and not just “do the miles” and Infinit has definitely helped me with that. My recovery formula has made a huge improvement with my recovery time between workouts and practices. I train 6 days / week so it’s very important that my body recovers properly every day. Muscle fatigue and soreness between workouts is no longer an issue for me. Infinit: Tell us something about you that we haven’t covered or something you’d like to share that we haven’t talked about. 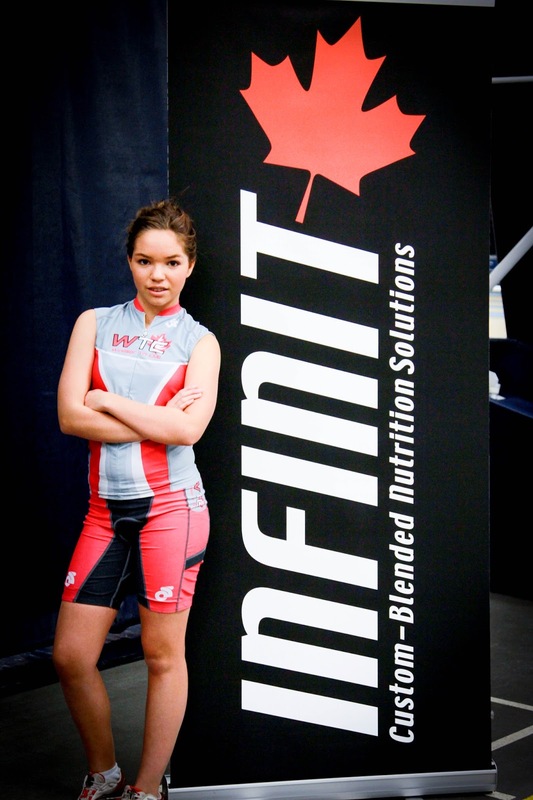 Meg: Being sponsored by Infinit, as a young athlete, is an amazing feeling. Infinit takes my sport seriously and takes my goals and me just as seriously as the professional athletes and Olympians they work with, which is a huge honour considering my age. With Infinit, I am now seen as a serious athlete within my community - the same as I see myself. It motivates me to know that others believe in and support me. Thank you! Continue to track Megan's performance through out the year, right here at TeamINFINIT.ca. In the coming months we will track her progress, check back with us routinely to see how the 2014 season is going. We are thrilled to fuelling Melissa's journey back to the Olympics in Rio. Ask INFINIT - Why Do I Get Stomach Cramps? Josh the CEO and I have been talking over the last month or so, ever since I learned of OrangeMud from a Laura Perry (Ultra Runner) tweet. 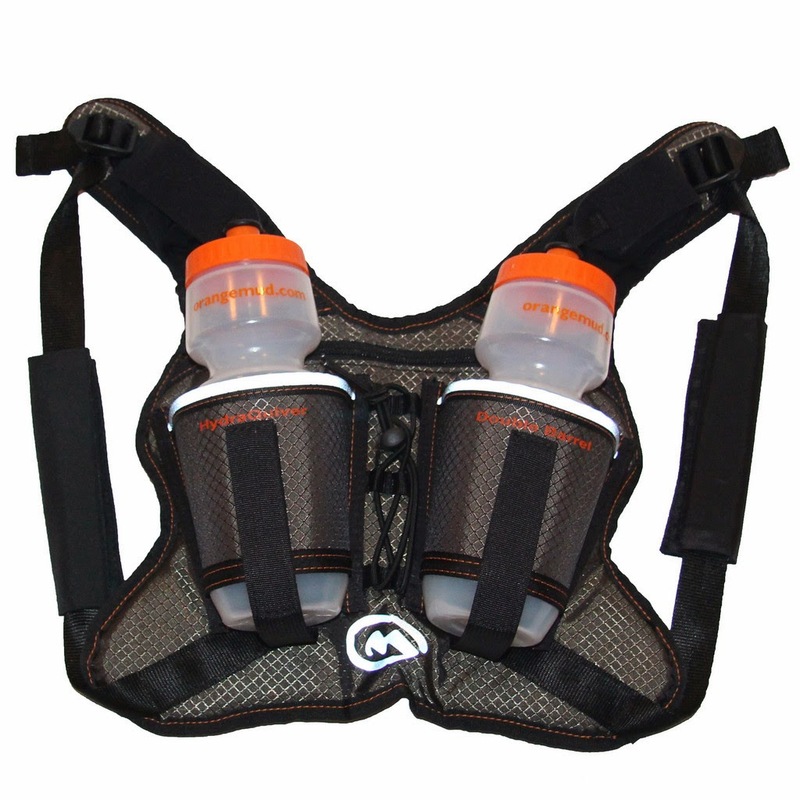 We have been looking for the perfect running hydration system for some time. Josh and I felt there was an opportunity after our first talk, we exchanged products, Josh got his own Custom Run Blend and some Repair. 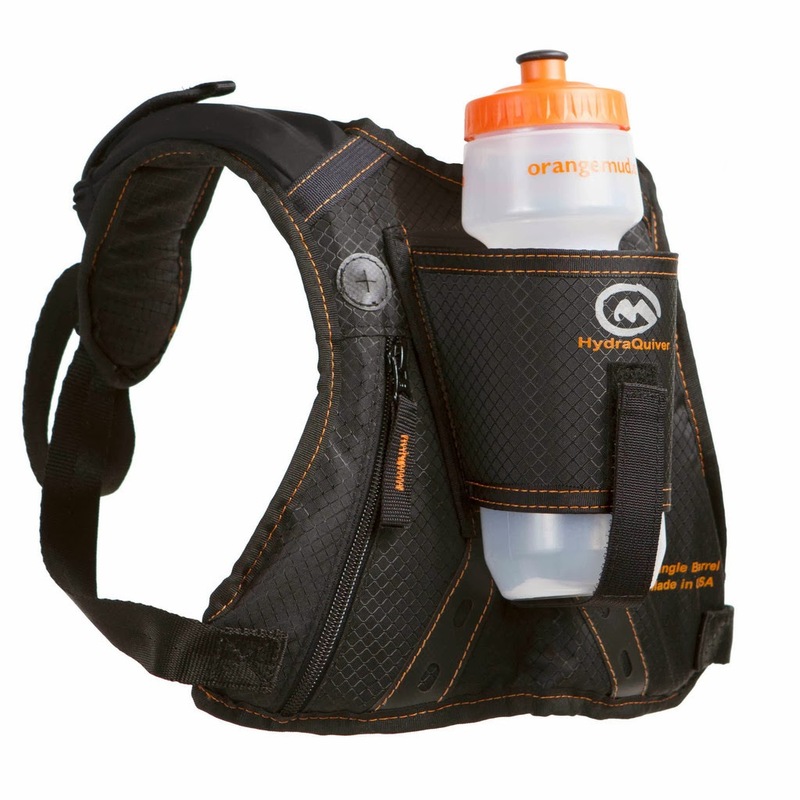 I got the OrangeMud HyrdaQuiver and Wrap - I have put the HyrdaQuiver through a couple of runs and love it. We have ordered some inventory for sale through our cart - look for it soon. We love this product, as much as Josh loves his custom product and his Repair. Check the cart in a couple of weeks or contact us directly if you are interested in learning more. Fully Customizable vs. eLoad "Customized"
We can help you fuel better, so you can do better.